Yup, that means all the banter normally seen between which playstyle is performing better is basically moot when you consider that any choice a DK makes can be out performed by every other class. The Destiny Softworks Blog has some excellent analysis and alternative sims to provide a view which says the difference between the three dps modes (unholy, frost 1h, frost 2h) is more about the player’s skill and the situation – which I don’t debate at all. The 5.4 projected analysis using tier also seems to suggest that the choice between specs for maximum dps is also far more about your preference and skill in execution than the spec itself. Well good. I don’t mind that, but it is beside the point. The simulations show Normal mode Death Knight dps ranging from 127k to 134k as the bottom three spec options, and Mages doing 159-173k dps as the top choice specs. A gap of 30-50k dps is a lot – consider a variance of ~50k in a 170k max is approaching a 30% difference. After considering an 8 minute fight even a 30k disparity is monumental – around 14 million health for the boss which is very easily the difference between a 1-3% wipe and a kill. Screw that. Oh, but what about Hard mode gear, or ideal vs realistic for each? Well lets just say I checked the SimCraft pages for every patch in v5 of Warcraft and at no time in any of the patch 5.n revisions have any of the DKs specs performed better than average. Patch 5.0 through to 5.3 the class from LFR level through to Hard Mode … has been generally exceedingly low, and rarely mid. Those DKs that you see (which might be cited in WoL parses) in raids doing very well are either competing with poor representatives of other classes, have brilliantly low latency to assist, or/and be exceptional players. Yes, and exceptional player will always be better, but give that player a Warlock/Ret Pally/Mage and you’re getting 50k+ dps more. It means bring the classes not the player, well maybe I mean it is saying “don’t bring a DK or probably not a Shadow Priest”. I know that is not meant to be the case, and that even saying that line is viewed as a QQ – but the sims tools show factors that reflect what I’ve been feeling but unable to put a finger on. As a totally subjective example – the weapon upgrade from 508 to 530 was significant in terms of item level for my DK, and should have been huge in terms of overall dps increase, but instead on the same fights I’ve been seeing almost the same numbers. I didn’t know why, but I’m beginning to feel that DKs are not scaling very well, and that our capacity for burst dps and extra damage on low health mobs (which is excellent for trash) hides the lower overall performance on long fights, especially those with one or a few targets. 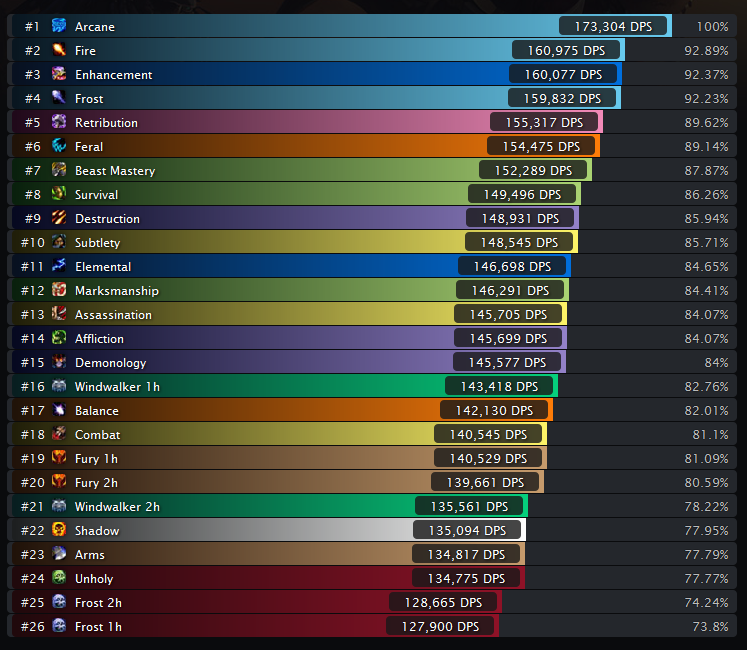 As a sample of the top Dps by boss in Throne of Thunder in Normal mode, via the World of Logs website – not a single Frost or Unholy DK shown in the top 10 on any fight. In fact Death Knights do perform very well in Dps on one fight AS TANKS on Tortos. Love those bats. I cannot change it any more than I can give Priests a new melee spec (why were Monks not a cloth wearing class?? Opps! Another time), but I can post about it. Show awareness. Show the desire for the spread of dps ranking amongst the classes to be balanced a little more. That means that Mages might not have all their specs in the top 5-6 ranks for instance, and that some classes with multiple ways to provide dps should have a distributed range in the ranks. Ideally. I’d also like to suggest that the lack of coverage in DKs in the patch notes indicates that they are not getting much attention, but it is not true. For now the alterations to Death Knights in Patch 5.4 are boosts. Good. Will it place a spec into at least the middle set of potential dps? Hopefully. Well at least they’re not punishing hybrids anymore. Kek. Happy Killing. This entry was posted in Death Knight, Raid, Warcraft and tagged 5.3, death knight, dk, dps, dps rank, relative, world of warcraft by Typhoonandrew. Bookmark the permalink. Of all of my dps toons (10, all but Druid, have viable dps specs that I play at least occasionally), my Combat Rogue (mid-i480s) is my only toon that feels, literally, impotent. He’s swinging a very soft … stick right now, I barely feel competent to run 5.2 dailies with him. My warrior feels light as well but not to the same degree. My DK actually feels about average, although that isn’t at i500+ gear level, he’s a bit below that still, so that could change with more gear as his dps flatlines and new gear becomes a gold sink more than a dps increase. Also, death to Boomkins… no clue what happened to that spec since Cataclysm but I went from enjoying it quite a bit to full-on raging incompetence within a few months. Nerf, buff, don’t care, it’s dead to me. Kitty died long ago. Bear/Tree4Life (or until Boomkin recovers its sanity, I do miss having a dps spec on that toon). I have a 546 equip dk and I’m going to be honest. Our numbers are terrible on my experience vs other classes in 25mans. In 10man raids with shorter fights our numbers are able to compete due to sustaining burst as the fights are short. But in 25s tgey are terrible. I don’t always trust Noxxic with a lot of things. When I was learning to bear tank, I went there first, only to discover later that what they were telling me was wrong (thank you, official WoW forums and Guardian theorycrafters). When I looked fight-by-fight in heroic, I found that it’s not quite as bad as Noxxic’s sim numbers, but it is pretty sad for DKs. Unholy is doing the best in Heroic 25s, consistently middle-of-the-pack. However, on some fights they’re in the top 5, and others in the bottom five. Unfortunately, Frost is pretty literally always at the bottom. Every single fight. Which means on the fights Unholy does poorly, even switching specs isn’t going to help. No idea what they’re doing with DKs in the next patch; hope they’re going to fix something for you guys. Hunter is worth a try, especially if you haven’t played since MoP started… the changes have been very positive, despite what you’d read in many of the Hunter blogs out there. I’m loving my Elemental Shaman… Destro Warlock is pretty good but not great (I’m still not sold on the Burning Embers mechanic, especially for AoE)… Fire Mage was frustrating but a recent switch to Frost solved a lot of those problems, been a lot more consistent (and a bit higher) in dps since making the switch. Also, DKs just got some nice buffs in the 5.4 patch notes as of yesterday, I’m assuming that came out post-your post. I’m reading it as a 10-20% dps buff. Should be enough to get back to a reasonable mid-pack level if that’s right.